For quite a while now, I've wanted to do a photoshoot of some of my quilts at the theatre where I work. But during a typical work shift there are usually hundreds of patrons in the lobby. This past week was a bit different, though. We had morning performances with young students from our local public schools. Since we had a bit of downtime in the lobby before they arrived, I enlisted the help of a coworker to photograph a few quilts on our grand staircase. First up is my cathedral window bed runner that I just blogged about. It looks so much better on this staircase than the one in my home. 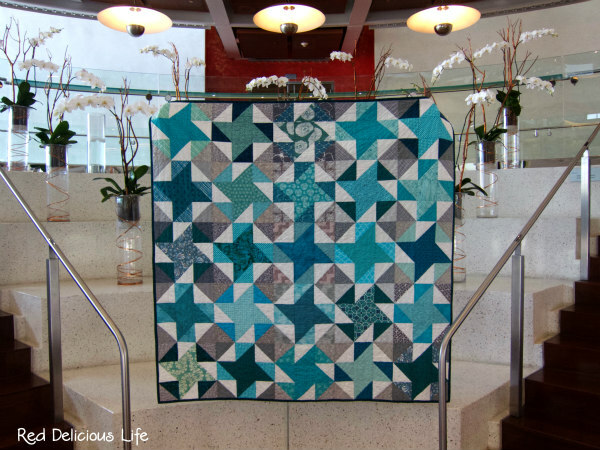 The other quilt that I brought that morning was my Turquoise Facets quilt. I just wasn't pleased with my original photo. Our broadway season kicks off this week so I'll be spending more time at work. My plan is to photograph all of my quilts somewhere inside the building. A lovely setting for lovely quilts! What a fun place to take pictures! 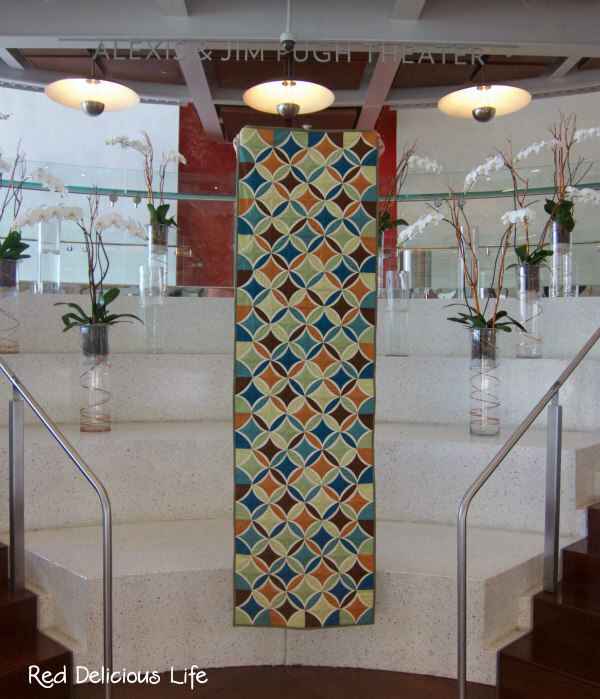 I want to bring quilts to work and take pictures of them near the waterfall/fountain near our entrance but I don't think security would appreciate it! Wow - what a great setting - just made for that bed runner! I have never taken any of my quilts on a photo shoot but feel the time is drawing close! Sounds like a fun plan - I look forward to seeing your photos! I recognize your lovely turquoise quilt - it looks awesome in that setting! Reminds me I need to put together my own bee block quilt soon!